While prevention is at the top of the waste management hierarchy in the European Union, there are few who have incorporated it in their daily lives. Most people, mainly due to lack of information, mistakenly identify it with reusing and recycling. This gap (of knowledge and daily practice) was what the three-year European project LIFE+ «WASP Tool» attempted to fill, beginning in October 2011 and ending in September 2014. 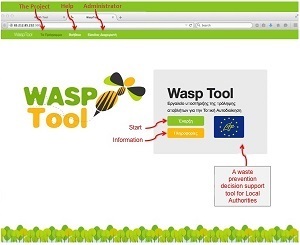 To achieve this goal, the staff of the project investigated what has been applied in other countries for waste prevention, assessed the effectiveness of the relevant actions and developed a decision support system called WASP-Tool, which evaluates and prioritises waste prevention actions that can be implemented by Local Authorities. The main objective of the project was to help Local Authorities to select and implement the best Waste Prevention Strategy for the specific local circumstances of two Mediterranean countries, Greece and Cyprus. To “run” it, please click on the tab “WASP-Tool”, on the website menu. A video-demo of the WASP-Tool is provided here . However, the project was not limited to this. It lead three major municipalities – Chania and Heraklio in Crete and Paralimni in Cyprus - to use the WASP-Tool in order to investigate the most suitable, for their local conditions, waste prevention activities and develop their own Waste Prevention Strategy. The three major municipalities were the Municipality of Chania and Heraklion Crete, in Greece, and the Municipality of Paralimni in Cyprus. It then guided them to implement on a pilot scale, the four most suitable waste prevention actions, and to develop campaigns for information, awareness raising and education of their citizens. To promote the concept of waste prevention, the project developed a networking platform for waste management stakeholders, in which Local Authorities, educators and partners from relevant projects could exchange knowledge and experiences on waste prevention. in the context of integrated waste management - lessons from the project LIFE +"
WASP-Tool » was held at the Harokopio University. Unfortunately, the presentations are available only in Greek.